This example creates an invisible attribute and attaches to the selected object (entity or component). 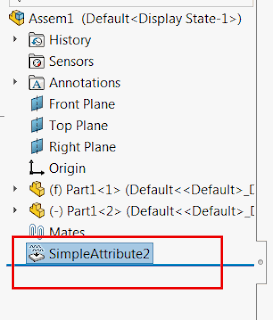 Attribute ca be hidden by setting the corresponding flag in the IAttributeDef::CreateInstance5 SOLIDWORKS API method. Macro stops the execution once the attribute is created. At this stage the attribute feature is invisible. When execution of macro continues (F5 or run is clicked) the feature is set to visible. Const ATT_DEF_NAME As String = "SimpleAttribute"